Welcome to Capri's Salon Link page! 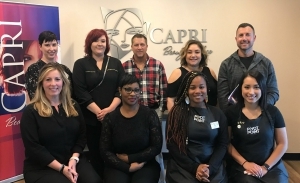 Employment is part of Capri's three-fold Mission Statement; we are dedicated to preparing our graduates for entry level positions in the beauty industry. It is the Mission of the College to bridge a harmonious relationship between student and salon for entry-level employment opportunities. If you are a student searching for employment, we encourage you to contact any one of our Career Service Advisers. Salon's seeking interns or stylists have several options including Guest Artist visits, posting help wanted announcements and in-salon visits from our Field Coordinator. Maybe you are looking to share your passion for the beauty industry with our students or need that perfect stylist to apply for a position in your salon. Registering as a Salon Guest Artist puts you in direct contact with our Program Manager who will gladly schedule your on campus visit with our students. Choose from a simple "Meet and Greet" to discuss the benefits of working in your Salon, or a classroom "Salon Demonstration" for a more educational approach. Capri graduates are in high demand! If you have a career opportunity in the beauty industry, or are looking for a student intern, we are happy to publish your information for FREE and release directly to current students and graduates. Antonia holds both a Cosmetology & Cosmetology Teacher's License and has been part of the Capri Team since 2011. As acting Salon Link Coordinator, Antonia works with Salon Owners on internship placement, Guest Artist visits, and Career Services offered by the College.